I Keep You in My Heart; 2015; paint, cut paper, collage, mixed media, digital. I took a lot of time off over the holidays since the boys and my husband were home for a couple of week and we were super busy with family stuff. While the time off was nice, by the end of winter break I was starting to feel cranky from not making any art! Still, getting back to the studio this week I've felt kind of aimless and had trouble getting back in the swing of things. I decided to combat my bad mental soundtrack of "I'll never have any more ideas or ever make any good work again" by just playing with some collage bits and making something just for fun. I've been wanting to do an illustrated alphabet for a while, so I started there, with E for elephant. We'll see what come next! Keep You; 2015, paint, cut paper, collage and digital. E is for Elephant; 2015; paint, cut paper, collage and digital. I designed a book! I finally got a copy of the finished product in my hot little hands last weekend and I'm so excited to see how it turned out. Friend and fellow NE Minneapolis artist Sarah Whiting received a MN State Arts Boards grant this year to publish a book of her collection of photos and interviews of Northeast Minneapolis artists and studios. She asked me to the do the graphic design for the project and it was a real treat to work with such gorgeous photos on such an amazing project. We kept the layout super clean to showcase the photos but with some special little touches to keep it current and fun. The book is called Open Studio: Faces and Stories of Northeast Minneapolis Artists. Printed by Bolger Printing, it has a library of congress number, ISBN number and everything—it's the real deal. Hopefully I'll have a few copies on hand to sell at my holiday open house on December 4. Holiday cards are now available in my website shop and on etsy! All cards are in stock and will ship within 48 hours. Let me design that for you! I know I mostly post eye candy pictures of my patterns and personal artwork, but in my day-to-day freelance life, I work on all kinds of graphic design and illustration projects. I'm that strange lady who actually thinks it's fun to lay out your newsletter! I have been doing graphic design and production since the mid 90's (yes, I'm that young!) and can bring my expertise to your project, large or small. I have experience working with all types of clients, from small retailers to non-profits, from artists to corporate clients. Need a new look for your business? I can work with you to come up with the perfect design. Need something designed within your current branding guidelines? No problem, I can work with that too. Need to put it online? I design for digital as well as print! I am happy to make your web banners and headers, facebook covers, avatars, website graphics, downloadable pdfs and more. Contact me to talk about your next project, I'd love to work with you! From top left: Logo and business cards for HKLaw, LLC (Denver, CO) as part of a comprehensive identity system, Simply Playing (Hopkins, MN) business cards, stickers and product hang-tags as part of a larger identity system; postcards for The Bridge For Youth (MInneapolis, MN); school sports team logo for Yinghua Academy (Minneapolis, MN); tour poster and facebook banner for The New Standards (MInneapolis, MN). 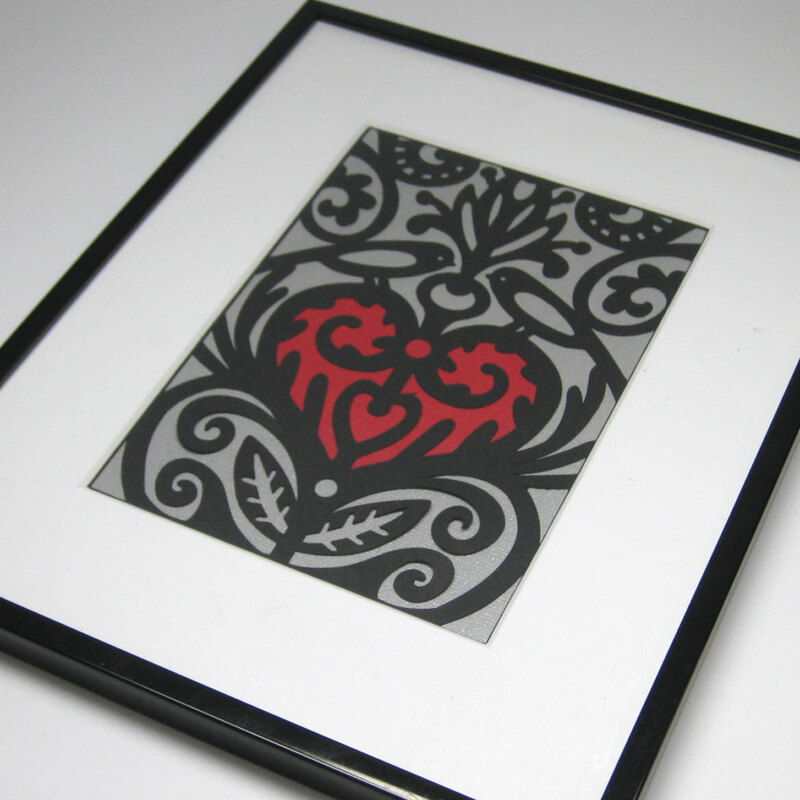 I've added four new hand papercutting patterns to my etsy shop. Take a peek! These patterns are delivered as a digital download, so no shipping costs. Happy cutting! I was asked to come up with some designs for a Confucius Day card inspired by contemporary chinese brush painting. I had a great time getting out my watercolors and inks and playing around. The final artwork was built digitally using a mix of scanned painted elements, mixed with additional "painted" art created directly in photoshop using a selection of Kyle T. Webster's amazing watercolor and ink photoshop brushes. I LOVE love love these brushes—they really look like watercolors, using my wacom tablet to paint. Plus, you can "undo" any accidents or strokes that you don't like, unlike real paint. You really can't tell what started as a scan and what I painted digitallyMy client selected the design on the left, and we're having it printed on a heavy art watercolor paper. Can't wait to see the final product! Yesterday the hubby, Eli and I enjoyed a tour of the new addition to Eli's school, Yinghua Academy, including a sneak peek into the brand new gym. It's so fun to see my logo design for the Dragons decorating the new gym wall! August will bring the installation of the new gym floor, and then we'll be ready to cheer the Dragons on in style. I just finished up a tour poster for The New Standards announcing their current Minnesota Arts Tour. It turned out to be a fun chance to play with type! The band wanted something clean, polished and contemporary, but still with an artsy twist. I added a "music collage" band at the side for a friendly touch. For the type treatment of the band's name, I started with one of my current font favorites, Arquitecta by Latinotype. After setting and adjusting the type in Illustrator, I brought it into Photoshop and used a layer mask to create hand sketched lines across the type using my Wacom tablet. Super easy, but a classy result! Happy to make work for such stellar musicians...be sure to catch one of their upcoming shows! Believe. Mixed media collage, cut paper, acrylic paint, oil pencil, markers, stabilo pencil. ©2014 Emily Dyer. For the past six month's I've been participating in Lilla Roger's Make Art That Sells: Assignment Bootcamp. Each month provided an assignment brief and other goodies along the way, with a monthly gallery of all the projects created. Our final assignment was to create wall art with the theme of a favorite drink, something inspiring we would hang in our own space. I decided to work with the collage techniques I've been playing with after taking Mati Rose's Daring Adventures in Collage E-course and this is what I submitted. The e-course was fun ride with lots of inspiration, and as always, the push to keep making good art! Check out all the amazing work created by my fellow bootcamp classmates on the class gallery!